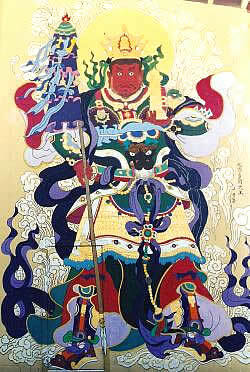 O Virudhaka, Great Heavenly King of the South Who Defends Truth and Controls Evil! Help me with your sword of Wisdom to conquer evil in my life. Help me to develop greater virtue. Help me to enhance the lives of all sentient beings. 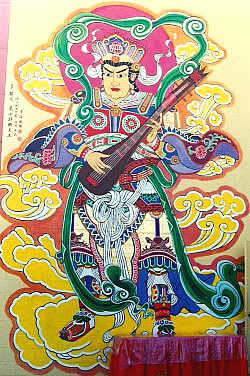 O Dhrtarastra, Great Heavenly King of the East Who Brings Ease and Creates Harmony! Help me to appreciate the good things life offers. Help me to conduct my affairs in moderation. Help me to uphold the smooth functioning of society. O Vaisravana, Great Heavenly King of the North Who Knows All and Protects Everyone! Help me to accumulate the Wealth of Knowledge. Help me to focus my thoughts on the pure Dharma. Help me to see victory. 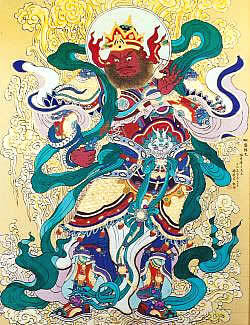 O Virupaksa, Great Heavenly King of the West Who Sees All and Brings the Serpent-Power! Help me to see beyond my limited preoccupations. Help me to appreciate the benefits of change in my life. Help me to be aware, and manifest the Bodhi mind. 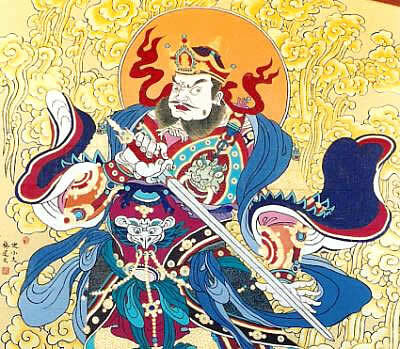 “virūpākṣa nāgādhipataye” can be translated as Virūpākṣa Lord of the Nāgas. 19-20. “Dhatarattha, King of the East, adviser to the Eastern clime, and Chief of the Gandhabbas, followed by a retinue of attendants, and with his many mighty sons (devaputtas), Inda their names, possessed of iddhi power, radiant, comely, and with a retinue, has come rejoicing to the forest to see the assembly of monks. 21-22. “Virulha, King of the South, adviser to the Southern clime, and Chief of the Kumbhandas, followed by a retinue of attendants, and with his many mighty sons, Inda their names, possessed of iddhi power, radiant, comely, and with a retinue of attendants, has come rejoicing to the forest to see the assembly of monks. 23-24. “Virupakkha, King of the West, adviser to the Western clime, and Chief of the Nagas, followed by a retinue of attendants, and with his many mighty sons, Inda their names, possessed of iddhi power, radiant, comely, and with a retinue of attendants, has come rejoicing to the forest to see the assembly of monks. 25-26. “Kuvera, King of the North, adviser to the Northern clime, and Chief of the Yakkhas, followed by a retinue of attendants, and with his many mighty sons, Inda their names, possessed of iddhi power, radiant, comely, and with a retinue of attendants, has come rejoicing to the forest to see the assembly of monks. 27-28. “Dhatarattha over the East, to the South Virulhaka, Westward Virupakkha, Kuvera over the North — these four great Kings stood illuminating the four quarters of the forest in the vicinity of Kapilavatthu.